Travelling soon, renovating your home or moving house? Your dog can stay happy and safe with a sitter from Pawshake. Pawshake has thousands of loving and vetted dog boarders who want to open their home and heart to your pooch. Avoid noisy dog kennels and give your dog a cosy holiday in a comfortable family environment. New to home dog boarding? What are home dog boarding services? Pawshake home dog boarding is an overnight pet care service that differs from traditional dog kennels. Instead, your dog can stay at a pet sitter’s house for the booking period and receive the very same love and care that they would at home. Will home boarding suit your dog? From big to small: we have your dog covered! Puppy boarding is a great choice when your precious pup is still undergoing toilet training or needs constant supervision. Many experienced Pawshake sitters offer puppy boarding in a puppy-proof home environment. Like puppy boarding, senior dogs can require supervision and care throughout the day and night. You can rest assured that your older pet will have the same comfort and care when home dog boarding as they would at home. It’s never a good idea to leave an active dog home alone for a long period of time: they will take out their energy on your new shoes or furniture. Instead, consider leaving your dog in a secure home boarding environment with plenty of play, attention and exercise. If your dog has a condition that requires extra care or supervision during home dog boarding, discuss this with your home boarding sitter - you can be sure they can accommodate your dog’s unique needs with love and care. If your dog is a bit shy, choose a home dog boarding sitter that doesn’t own other pets or have other bookings. Dogs that suffer separation anxiety are also more comfortable in cosy home than in a noisy, unfamiliar environment such as a dog kennel. When you book through the Pawshake platform, your pet is automatically covered by our Premium Pet Protection insurance in case of accident or illness during the booking period - whether overnight boarding, long-term boarding or any stay. Pawshake sitters are veterinary students, retired couples or young families who love having dogs around. If you don’t feel like asking family or friends or to look after your pet, why not ask an enthusiastic Pawshake pet sitter? If you need a specific boarding service, such as puppy boarding, senior pet boarding, grooming or medication, you can ask your sitter to perform these tasks. Your dog can receive the same loving care as they would at home. 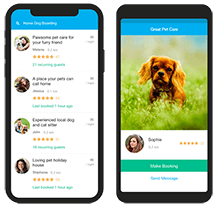 If you are worried about missing your pet when you are away, fear not: your pet sitter can keep you updated with photos and messages of your pooch having a great time during the home dog boarding service period. You can even plan a fun video call with your dog!